Went on a little shopping excursion this weekend and got some new baking supplies. Desperately needed a cooling rack and finally got a mini-cupcake pan that I’m really excited about. I tend to bring my treats in to work with me but often the recipe doesn’t make enough for the the whole office so I have to make two batches, which kind of defeats the point of bringing them into work to get rid of them in the first place.Tested out a bunch of new stuff on Sunday when I made these mini gingerbread cupcakes. I still need practice on my frosting skills for sure but sprinkles help. Everyone seemed to love these even though they were a little crispy on top. Although I’m partial to making desserts, my other specialty is breakfast. This is the a sort of benedict-like tofu dish, but mostly just in looks. 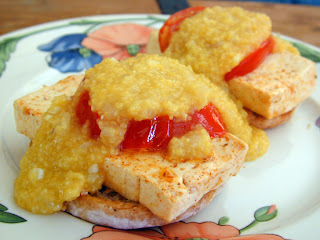 English muffins topped with seasoned, grilled tofu and tomatoes. Instead of hollandaise sauce, they’re covered in a creamy polenta cooked with onions and lots of garlic. I’m still going to have to experiment with some vegan hollandaise recipes but this was delicious in a whole different way. 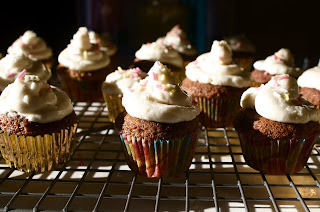 Today started with some pumpkin spice cupcakes. These are probably the first cupcakes I ever made, and they’re still one of my favorites. Though I usually just go with the plain white frosting, I had a bit of fun decorating these for a friend’s birthday. Also, learned a lesson today: it is a lot more difficult to transport on a bicycle than you might think. For dinner tonight I made lentil loaf with mashed potatoes and nutritional yeast gravy. My boyfriend has been working very hard lately so I’ve been trying to make some special dinners in the past week, including penne a la vodka and bubble and squeak. I have to say that the gravy turned out super good. I’ve made lentil loaf before and while this was still really good, I think my lentil cooking skills this time were not quite there. Overall though, delicious dinner, with lots of leftovers. Yum. Another really exciting thing for me is that I got some yarn that I’ve had my eye on for quite some time now. Turns out to be perfect timing, because it’s just the time of year to really get knitting. Here are some mini lemon bundt cakes I made just a few weeks ago. I veganized a recipe that I’ve attempted many times in the past but pretty much gave up on until this time. They’ve never come out looking so good. They were a lot more cakey than I expected but delicious with such a sweet lemon icing on top. I bought this mini bundt cake pan specifically to make these guys but I find it makes a lot of regular recipes more fun. Like banana bread. Somehow things are just more exciting when they’re in single servings.I’ve actually been baking up a storm lately. Trying to get in some good practice although this sweltering weather is probably not the best for hanging out in the hot kitchen. Of course I don’t have photos of all the treats I’ve made lately. Tonight’s project was oatmeal cookies. So yummy. Hopefully I’ll get some brownies in this week and come up with some other ideas. Also really looking forward to making some vegan ice cream since it’s so hot. Even after the disaster that was my last attempt (okay it wasn’t a disaster, it was just um, crunchy). I’ll be honest, I’ve never liked cheesecake. I only started eating cheesecake when I became vegan because it’s one of the most common vegan desserts around oddly enough. So I have grown to like it over the years, but quite often there is something a little off about vegan cheesecake. That is not to say I haven’t had a few that have been quite delicious. In any case, I decided to try my hand at it. I have to say the results were fantastic. I combined a couple recipes I found to come up with a lemon cheesecake that was light and fluffy with just a hint of lemon. I will admit that I used a store-bought crust. Next time I’ll try my own. I want to be posting a picture of the lemon bars I made this week but they were so good they were eaten immediately. So good. You would have no idea that they were vegan. This is not something I would usually say about my desserts since it makes vegan sound like a bad thing. In this instance though, the crust was just so flakey and the consistency of the lemon filling was just unlike anything I’ve had. Let me just say again…so good. It was possibly the best dessert I’ve made so far. Instead here is a simple chai tea cupcake. This batch came out okay, but I desperately need a new oven! I’m also not as big a fan of cupcakes that use soy yogurt in the recipe. Perhaps it was just the uneven baking of the cupcakes this time though.